The lovely Alison at farmhouse traditions recently nominated me for a Liebster award. It means I need to answer some questions she has set and then nominate other blogs I like and follow, to do the same. While I am very happy to answer the questions, I won't be nominating any other blogs from my long list, but if anyone wants to join in, please do. I have two in particular - Jewellery making and felt making. What's your home area like? I live towards the eastern side of the UK, in a large rural county. 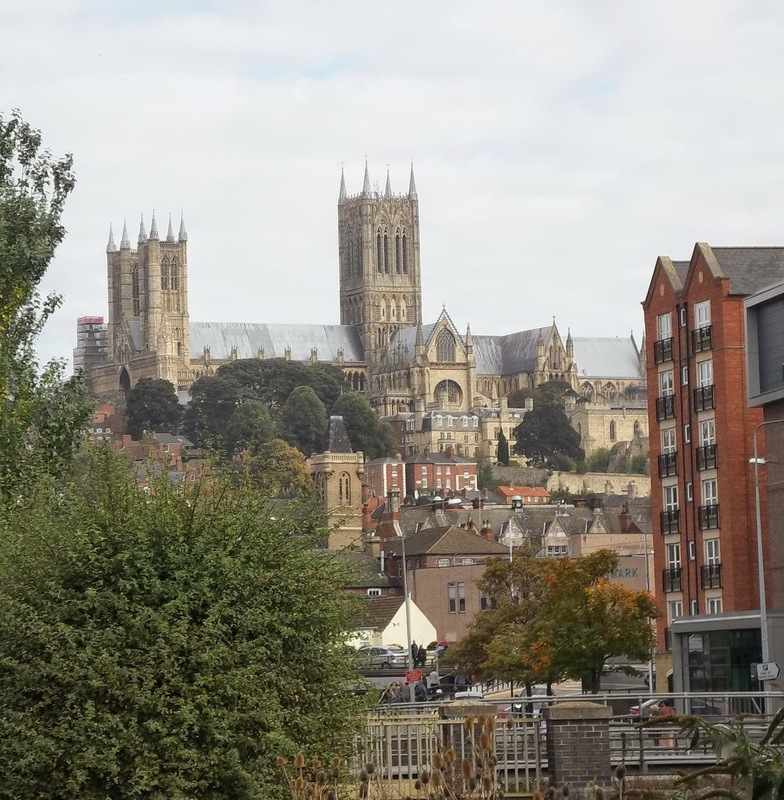 I live in Lincoln itself, which has a Cathedral and Castle. The area I live in is is predominantly terraced housing, dating from Victorian times onwards. Holidays spent in Hunstanton, in Norfolk. Going to the fair and riding on the gallopers, eating cream cakes and making sandcastles on the beach. I work as an administrative assistant in a University. What's your favourite animal and do you have pets? My favourite animal - I like members of the cat family but I also like the elegant lines of the greyhound. 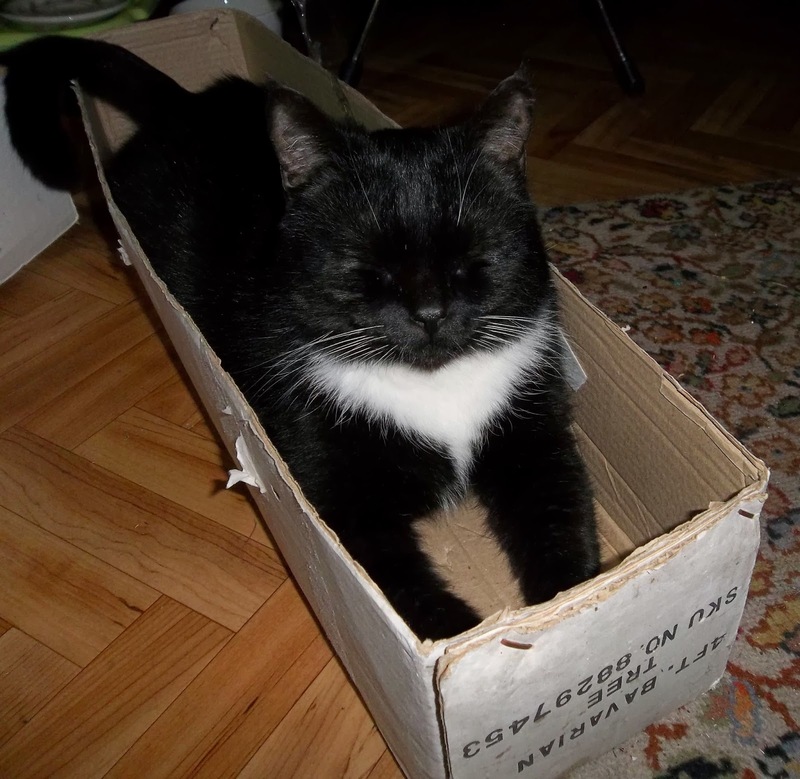 Yes, we have two cats: Scruffy (in the box) and Ginny (on the chair). How are your happiest days spent? Visiting gardens with good friends or being creative at home. On a personal and selfish level, I would like to age gracefully without too many aches and pains, continue to be able to enjoy my crafts and upsize, so that I can have a studio/craft room and the craft materials will not intrude into the rest of the house! "No-one can make you feel inferior without your consent" Eleanor Roosevelt. Is there a craft which you would like to try? 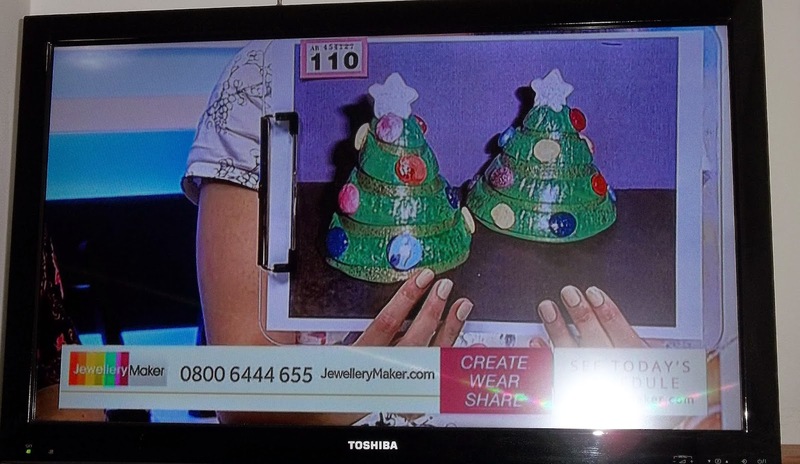 My little polymer clay Christmas trees appeared on the TV yesterday - I sent a photo of them in to the Wall of Fame (where you can send in photos of your work, as long as the materials are predominantly bought from Jewellerymaker) on Jewellerymaker and they were featured! (Apologies for the flash off the TV screen). As you can imagine, there was great excitement for those few seconds! I hope you all have a Merry Christmas. Dear Ellie, I loved to read those things about you! So nice to know a little bit more .... ;-) Your Christmas trees look so sweet and colourful, no wonder they showed them ! I wish you a Merry Christmas an lots of love, Mirjam. Thanks, Mirjam. I could have written a lot more when answering the questions, but decided to try to be concise (so that boredom wouldn't set in for any readers!) I was ridiculously excited to see the trees on TV, even if it was just for a few seconds. Wishing you and your family a Merry Christmas and a Happy New Year too. Thanks, Amy. It was great to see my trees on TV. My moment of fame! Have a lovely Christmas too. 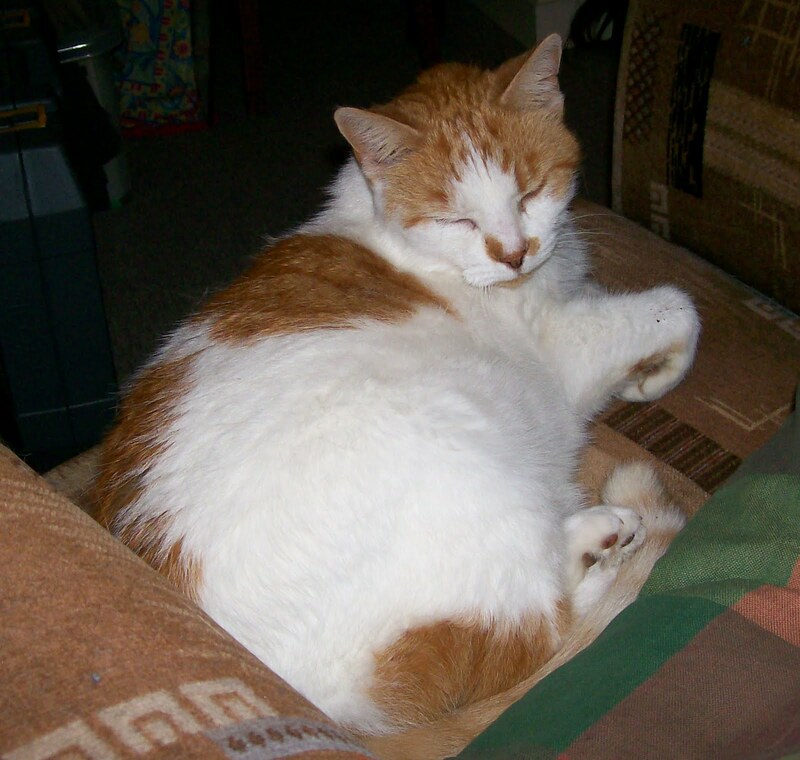 I loved learning a bit more about you (and seeing the furry overlords who live with you). I would love to learn lead-lighting or glass blowing. Sadly my hands and heat sensitivity mean they won't be a happening thing - but I will continue to admire other people's art. Merry Christmas - and a creative New Year. Thanks, EC. Furry overlords is right - they really do rule the roost. My husband, Chris, went on a stained glass course and initially was very keen on continuing, until we found that you really do need designated areas which aren't used for anything else...hmm, not going to happen in this house! See, we really do need to upsize...honest! I hope you and your family have a good Christmas too and a healthy (and happy) New Year. I don't think I knew that you live in my favourite city, how lucky you are. Congratulations on being featured on the TV. I hope that your Christmas is going well. Thanks, Toffeeapple. I didn't know that Lincoln was your favourite city! I was surprised and delighted to see my little trees on the TV (even if it was only a few seconds). Merry Christmas to you too - I think I may have eaten too many biscuits today!